(CNN) -- Nick Stevens was supposed to be spending Saturday night eight stories above the Texas Motor Speedway, partying with classmates at Guyer High School's senior prom. Northeastern University students had to settle for a picture with their deans instead of handshakes. Instead, the senior class president is going paintballing, trying to make the best of a disappointing situation, after school officials decided earlier this week to postpone the prom due to concerns over swine flu. "I thought it was an extremely unwise decision. There are a lot of different ways they could have handled it," said Stevens, 18. "They have Breathalyzer tests to see if people are drunk. They could've checked temperatures to see if people had flu-like symptoms." Texas has the second highest rate of confirmed swine flu cases in the United States with 28. The nation's only death from the 2009 H1N1 virus -- commonly known as swine flu -- also occurred in Texas: a 23-month-old boy who was visiting from Mexico. In an e-mail from the Denton Independent School District, students learned that all schools in the district would be closed this week and that Guyer High School's prom would be rescheduled for May 29. But Stevens is skeptical that the date will stand. "Sure, it's going to be postponed, but if things still get worse we don't have any idea if they'll keep it," he said. "The longer we postpone it, the more people that are going to get the flu." As of Saturday, the U.S. Centers for Disease Control and Prevention reported 161 confirmed cases in 21 states, up from Friday's total of 141. New York has the highest number of confirmed cases, with 50. Texas has 28 and California has 24. The U.S. Department of Education said that as of noon on Friday 433 schools, with a total of 245,449 students, in 17 states have been closed. In Texas, school officials have postponed all interscholastic sports until at least May 11. Alabama has taken a similar step, stopping competitions until at least Tuesday. "They were saying you could smell the Purell all over the stage," said Vicki Chachere, a spokeswomen for the University of South Florida, which is holding six graduation ceremonies this weekend in cities throughout Florida. Bottles of hand sanitizer were available at both ends of the stage as students stepped up to receive their diplomas. USF President Judy Genshaft will be on the stage to personally congratulate the roughly 8,000 students expected to walk in this weekend's ceremonies, but she's not going to shake their hands. "Instead of coming up and shaking hands, the students come up and pose for photos with the president," Chachere said. "This was not about the president's safety because she knows what to do as far as not touching her eyes or mouth -- she's been doing this for a while," she said. "For the safety of the people whose hands she was shaking, she didn't want to inadvertently pass on the virus." 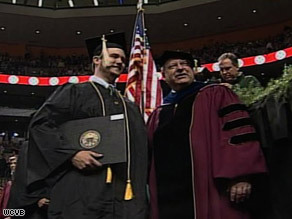 Graduates at Northeastern University in Boston, Massachusetts, also had to forego the hand-shaking tradition in favor of a photo with school deans. "Since direct contact is one of the ways flu viruses spread, we have decided to forgo the traditional congratulatory handshake as you come forward to receive your diploma and have your photo taken with your dean," the school told students in a letter posted on its Web site. But those students fared better than those at Cisco Junior College in West Central Texas, which canceled graduation ceremonies yesterday, the college said. Instead, students will get their diplomas by mail. Some of the changes to the traditional graduation program brought unexpected but pleasant surprises. Dan Godshall and 19 other students at Slippery Rock University in Pennsylvania attended a private graduation on Saturday for students had recently visited Mexico. The college decided to let them walk in their own graduation out of fears that they made have been exposed to the H1N1 flu outbreak in Mexico. "The university has received hundreds of calls from students and parents who were worried about being exposed at the commencement ceremonies," the university's vice president said in an e-mail. "We have an obligation to protect others from what they perceive is possible exposure to this virus." When he heard the news, Godshall was worried about how he would tell his mother. "At first I was like, no way, no way," Godshall told CNN. "I thought my mom was going to freak," he said. In the end, the small ceremony created an intimate setting that made it all the more memorable, Godshall said. "It was just great because it was just us and we were allowed to say intimate things that made it more personalized," Godshall said after the ceremony. "I wouldn't change it a second of it." CNN's Brad Lendon and Mallory Simon contributed to this report.